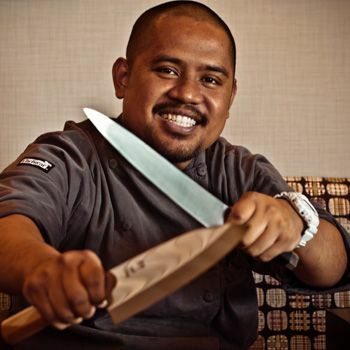 Having cut his culinary teeth while working at Aloha Mixed Plate and Old Lahaina Luau, Simeon took a new direction with Star Noodle (all three are owned by the same company, by the way). 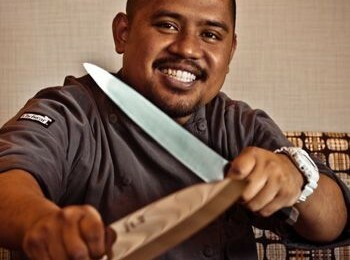 He effortlessly blends traditional Pacific Rim dishes with traditional Hawaiian influences, and the results are superb. The primary menu is an eclectic mix of small plates and noodle bowls; we recommend you go in a group to sample and share as many items as you can. On a recent visit, the Steamed Pork Buns were an instant hit, as were the Vietnamese Crepes. The Hapa Ramen was a generous portion size, and a nice step up in flavor from most of the ramen houses we’ve been to lately. Malasadas were a must for dessert, but we have to admit, we were lustfully eyeing the Mango Pudding shared by a couple at a neighboring table. Be prepared for a wait if you arrive during prime dinner hours, but rest assured it will be worth it. Prices for most items are in the $7-12 range — quite reasonable even if this weren’t Maui. In fact, despite (or perhaps due to) the fact that this was one of our more lesser expensive meals during our stay, it ended up being one of the most memorable dining experiences, even compared to the more high-brow dining establishments we visited. Star Noodle is located at 286 Kupuohi Street, in the industrial outskirts of downtown Lahaina.